In blender, place 1 cup strawberries, the tequila, liqueur, lemon juice and sugar. Cover; blend on high speed until strawberries are pureed. Add ice. Cover; blend 30 to 60 seconds longer or until ice is crushed. Add basil leaves. Cover; blend until basil is finely chopped and mixture is well blended. Pour into 2 margarita glasses. Garnish each with 1 basil sprig and 1 strawberry. Serve immediately. Like a salted glass for your margarita? It’s easy to do: Rub the rim of the margarita glass with water, then dip into kosher (coarse) salt. You can also buy margarita salt for this purpose. Instead of water, try rubbing the rim with the same juice used in the cocktail, such as lemon juice in this recipe. 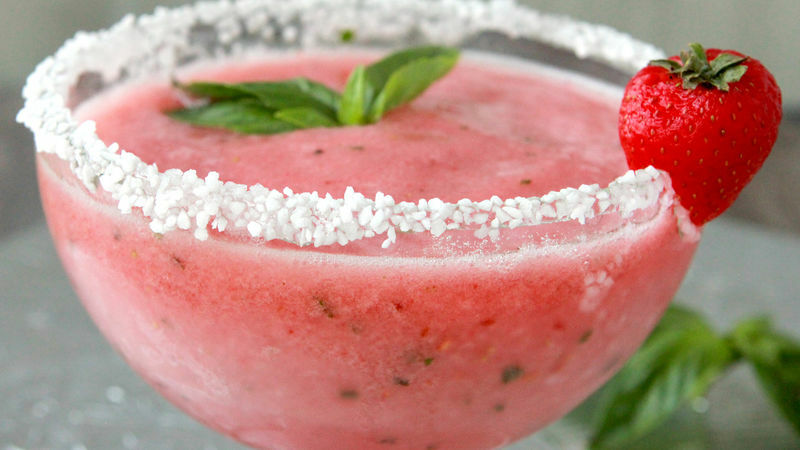 Make Raspberry Basil Margaritas by substituting fresh raspberries for the strawberries. Don’t like tequila? Replace it with vodka for a Strawberry Basil Martini. Put the ice in a cocktail shaker or pitcher instead, then add the blended strawberry-basil mixture and shake or stir. Pour into chilled martini glasses, straining out the ice.